We have designed these game bundles to offer the best value possible. If you would like to download and test a game before buying, just click the name of the game. These games are for Windows computers (Windows 95 or later). All were written by Nick Sullivan of AHA! Software between 1995 and 2005. If you own an Android phone or tablet, please check out our Mobile and web games page. You’ll find descriptions and details about our apps, and links to their Google Play pages. You can even try out free sample versions of each game in any modern web browser, even if you don’t have an Android device. Keep your wits about you and persevere! That’s the key to completing the quest in a Family Games adventure. The Adventure Package includes all three adventure games. In Santa’s Secret Valley you play the role of an elf who must save Christmas. 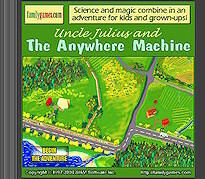 In Uncle Julius and the Anywhere Machine your scientific uncle has gone missing, so naturally some of the puzzles have a science theme. All Aboard for Santa takes you back to the Secret Valley for a summer-time adventure. All of our games are free to download and try. If you’re ready to complete your adventures, buy the Adventure Package now for just $30.00 US (a saving of $23.00 US). Christmas has always been the highlight of the year at our house. The very best of the season to you all! Our Christmas Package is suitable for all ages. The adventure games, the classic Santa’s Secret Valley and its sequel All Aboard for Santa, are best for reading age and up. The point-and-click activities in I Live at Santa’s House! will enchant preschoolers and any child who loves to dress doll, bake cookies or decorate the Christmas tree. To try a game before buying, just click the link. These games will put you in the mood for Christmas! Buy the Christmas Package for just $30.00 US (a saving of $20.00 US). These games sneak in some learning while you’re having fun. Our Learning Package includes five games. For the younger children, there’s I Live at Santa’s House! and Twisted Tails. Everyone of reading age and up will enjoy our word games, the fast-paced Alphen and the multifaceted Spell-Mell. Improve your knowledge of the countries of the world with World Geography Tutor. The Learning Package is great value — bought separately, these games would cost $73.00 US. Buying them as a collection saves you $43.00 US. Don’t forget, all the games are free to download and try. Just click the link. If you’ve decided this collection is the right one for you, you can buy the Learning Package for just $30.00 US. Our Deluxe Package gets you the whole collection — all eight of our finest games for families around the world. A comprehensive treasury of fun for you and yours.